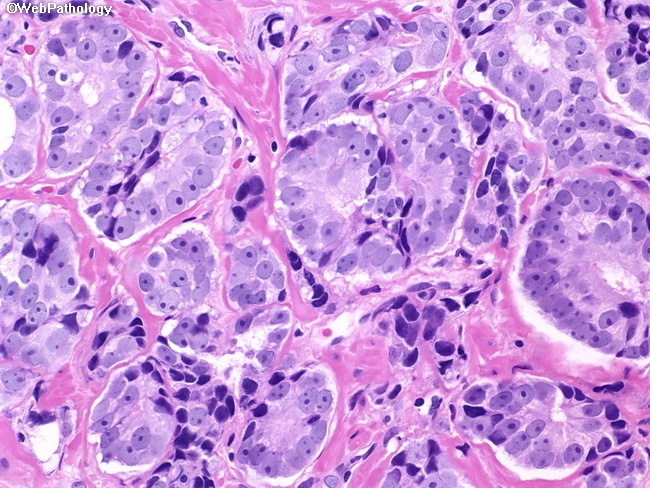 Prominent nucleoli are an important feature in the diagnosis of prostate cancer on needle biopsies. Many nuclei in this image show one or more eccentric nucleoli. However, one has to be cautious. The diagnosis should not rest solely on the presence or absence of prominent nucleoli. A number of variables come into play that can mask nucleoli in malignant glands or show punctate nucleoli in benign mimics.